I wear the same outfit every day. I love it. Black top, denim skirt (or jeans). When I’m at work, I jazz it up a little – but not much. Sometimes on a hot summer day I break out the grey. That’s about it. I feel no need to change – ever. This picture explains why. For most of my childhood I was Rainbow Bright. That dress I’m wearing – bright pink with a turquoise sash? It was reversible – no joke – flip side was turquoise with a pink sash. Now please – go off and wear your yellows and greens. More power to you. But with any luck, I’ll be 90 and still wearing my uniform. Just look at my mom. She looks so hip and beautiful. 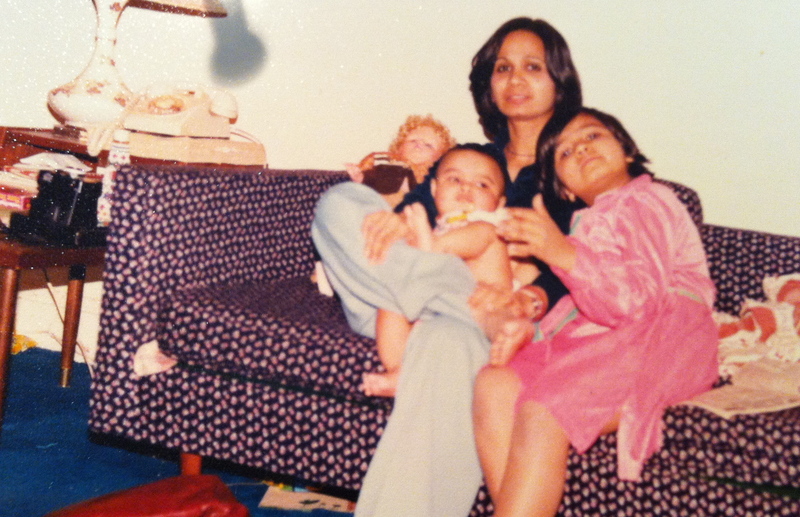 This picture was taken when we lived in Queens (all Indians must live in Queens at some point, it’s a rule). The baby on her lap is my cousin – who is literally 8 feet tall now – really. ha! Can you imagine all the posts on wine coming your way 🙂 Thanks so much for following me! Having an equally “colorful” childhood I find that I wear something black almost every day. I’m wearing a black blouse as I type…nice post. Looking forward to reading more! @lovedmuch Thanks for tuning in – appreciate it. Also, didn’t Steve Jobs wear the same “uniform” every day? We keep good company.